This is the Seattle based band from 30+ years ago, the band that was fronted by the late great Rockin' Robin Roberts, whose snarly whine predicted sixties punk, and whose raw recording of "Louie Louie" was the likely first of over a thousand covers of Richard Berry's immortal rock monster. 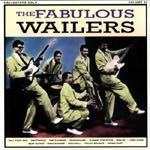 This CD is a two-fer, containing the entire first album The Fabulous Wailers from 1959, and their 1964 album Tall Cool One. They had a national hit in '59 with Tall Cool One. There's nothing purely surf here, but several of these tracks have been surfed up by surf bands, and others sure should have been. This is a vital and necessary pre-surf band, the prototype for what became the Pacific Northwest Sound. Now, I love the Wailers, but this is just a pale attempt to recapture "Tall Cool One" by playing a clone slightly faster, or did it come before? Maybe it was the earlier arrangement. I don't know. It's a solid Pacific Northwest rocker.